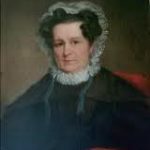 Elizabeth Reade was born in November 1614 in Wickford, Essex, England, the daughter of Edmund Reade. She was said to be calm, well-mannered, and an excellent housekeeper. She was well versed in the Scriptures, and a devout Puritan. She met John Winthrop, Jr. in 1634. 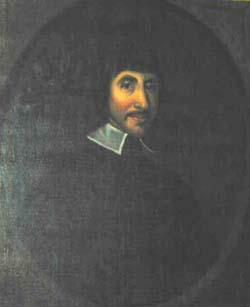 John Winthrop Jr. was the eldest son of John Winthrop, Sr. and his first wife Mary Forth. His parents were wealthy, and in 1622, at age 16, young John was sent to Trinity College in Dublin, Ireland, for a general education. Two years later, he returned to England and studied law until 1627, when he went to sea, first to France as a secretary to a captain on a military expedition, then to Turkey, Italy and Holland as a regular traveler. Image: Connecticut Governor John Winthrop Jr. When Winthrop came home to England in August of 1629, he found that his father was preparing to leave for America as the governor of the Massachusetts Bay Colony. 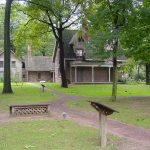 His father left in the spring of 1630, and John stayed behind to care for his stepmother, Margaret (Tyndal) Winthrop and the Winthrop children, as well as his father’s businesses. 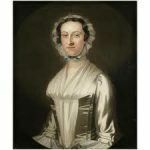 On February 8, 1630, Winthrop married Martha Fones, his cousin and daughter of Thomas and Anne (Winthrop) Fones of London. Some of their correspondence after marriage was in code, and not deciphered until almost three centuries later. In 1631 he followed his father to Massachusetts; in late August John, his wife and the other Winthrops left for Boston. The group arrived in October 1631, and John Winthrop, Sr. was elected the first governor of the Massachusetts Bay Colony. In December John Jr. was elected as an Assistant to the Colony and was re-elected to that position many times during the 1630s and 1640s. In March 1633 he established a settlement at Agawam (now Ipswich). His wife and infant daughter died there in the summer of 1634, and he returned to England to visit friends. On July 6, 1635, he married Elizabeth Reade in England. The couple had nine children, one of whom was Fitz-John Winthrop, a future governor of the Colony of Connecticut. While in England, Lords Brooke, Saye and Sele hired Winthrop to establish a colony on land at the mouth of the Connecticut River, and agreed to make him governor for one year after his arrival there. John and Elizabeth returned to Boston in October 1635, and in November he sent twenty men to claim the land and build some houses there. He named the area “Saybrook” in honor of his employers; he worked on the Saybrook project until his commission expired in July and then returned to Massachusetts. Winthrop became governor of both the Connecticut Colony and the Saybrook Colony at the mouth of the Connecticut River. He then lived for a time in Massachusetts where he devoted himself to the study of science and attempted to interest the settlers in the development of the colony’s mineral resources. The Massachusetts Bay Colony had conquered the Pequots of eastern Connecticut in 1637 and considered Pequot lands to be its territory. In 1640, the Colony gave Fisher’s Island to Winthrop, but he chose a site on the mainland across from his island, and named it “Nameaug,” which later became New London, and the Winthrops moved there in 1647. Winthrop was then serving in the government of the Bay Colony, and traveled back and forth to Boston. However, the New England Confederation, formed to encourage cooperation among the New England colonies, ruled that the New London area should be a part of Connecticut. Winthrop refused re-election to the government of Massachusetts Bay Colony, was declared a freeman of Connecticut in 1650, and became active in Connecticut politics. Winthrop built a grist mill in New London and was granted a monopoly on the trade for as long as he or his heirs maintained the mill. This was one of the first monopolies granted in New England. He became one of the magistrates of Connecticut in 1651. Winthrop was an avid chemist and practical scientist, famous for starting one of the first ironworks in Massachusetts (1633), for his interest in developing mines, and for his experiments in obtaining salt from sea water by evaporation. He had previously acquired some mineral rights in Connecticut, but in the 1650s, he obtained even more. While the cost of exploration and development was his, the knowledge he gained about the deposits benefited the Colony of Connecticut. He was also a physician, who treated an average of twelve patients a day by traveling around the colony. It is believed that he served up to 500 families out of a population of some 5000 persons. He was so successful that the people of New Haven persuaded him to move there in 1655. The real attraction for him was not the free house and other amenities that the town offered (which he refused), but that he had ironworks there that he wanted to develop. New London tried to lure him back, but in May of 1657 he was elected Governor of Connecticut Colony, and moved to Hartford. He could not be re-elected in 1658, as the one-term-only rule for governors was still in effect; that law was changed as of 1659. During 1658, John Winthrop served as Deputy Governor. From 1659 to 1676, John Winthrop was always re-elected as governor, and continued to be successful because he was an excellent diplomat and very popular. Normally, colonies could not be started without permission from the Crown. But the Connecticut Colony had been established without an authorized charter, though with permission of the government of the Bay Colony, in answer to church differences and crowding in the Bay Colony. This was not a problem as long as the Puritans were in power, but in 1660, Charles II was restored to the throne. This placed Connecticut in an awkward position – a colony of Puritans, with no real legal status. It was completely at the mercy of the Crown. Governor John Winthrop was sent to England in 1661 as the agent of the Connecticut Colony, to obtain a charter. Lord Saye, Winthrop’s former employer and a Puritan, had friends in high Royalist circles. Winthrop gained a charter for Connecticut in 1662, which also merged the New Haven Colony with the Connecticut Colony. This came as a surprise to most citizens of the New Haven Colony, and some of them were extremely upset. Discussions were held between the two colonies, until the Colony of Connecticut officially took over the government in 1664. A number of New Haven colonists who were still unhappy with the situation left for New Jersey in 1667. Winthrop decided in 1667 that he needed to leave the governorship and devote time to his own businesses, but the Connecticut Colony refused his resignation and exempted him from some taxes to persuade him to stay in office. He tried to resign again in October of 1670, but the Colony again refused to grant his request, raising his salary and giving him land as a further enticement to stay. Elizabeth Reade Winthrop died on November 24, 1672, at Hartford. John Winthrop did not remarry. John Winthrop was a man of many talents. He had a mind with a scientific bent, one that was curious about everything. In an age when most people had only several books, he had a library of a thousand volumes, on various subjects, in a number of languages. He corresponded with scientists in England and was elected a fellow of the Royal Society of London for Improving of Natural Knowledge. He read papers before that Society and sent them a number of New World natural curiosities. King Phillip’s War had caused the New England Confederation to be convened in Boston in the fall of 1675, and the deliberations went into the spring of 1676. Winthrop had attended, and was preparing to leave Boston at the end of March, when he caught a cold. John Winthrop Jr. died on April 6, 1676, in Boston. He was buried in the King’s Chapel Burying-ground beside his father.